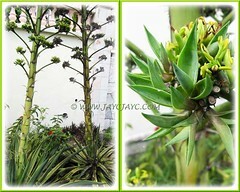 This variegated form of Agave desmettiana is obviously more charming than the typical non-variegated species. An elegant medium-sized succulent shrub, Agave desmettiana ‘Variegata’ showcases bright green to blueish-green leaves with creamy to golden-yellow variegation along the margins. Simply enchanting! We were excited when we chanced upon a colony of these plants beautifying the landscape outside a bungalow house in a nearby residential area last October. And, were even more captivated when we observed two flowering stalks towering above the plants a few months later, with a third addition not long later. A dramatic beauty, fabulously structured as an urn-shaped rosette that’s popularly grown as an ornamental plant for the landscape in the ground or in a large modern container for outdoors and indoors. Just need to grow a single Agave desmettiana ‘Variegata’ plant in your garden for that lovely tropical look and it will perpetuate itself by producing offsets readily from below the rosette as seen on the left image. Besides, it will produce numerous aerial bulbils/plantlets on its flowering stalk which occurs only once when it’s about 10-15 years old, before it expires. 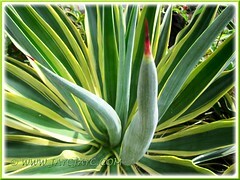 Isn’t that great… free Dwarf Variegated Agave for life! 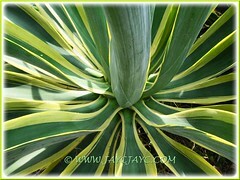 Common Name: Dwarf Variegated Agave, Variegated Smooth Agave, Variegated Smooth Century Plant. Etymology: The genus Agave is derived from Agavos in Greek, meaning ‘admirable‘, ‘noble‘ or ‘splendid‘. The species epithet desmettiana is named after the Belgian horticulturist and nursery owner Louis De Smet (1813-1887) who introduced this species to Europe. 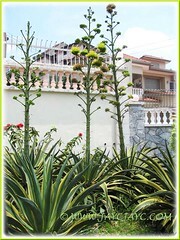 Features: Agave desmettiana ‘Variegata’, a dwarf Agave species that has an approximate height of 0.6-0.9 m (2-3 ft) and a crown spread of 0.9-1.2 m (3-4 ft). An evergreen succulent plant with a slow to medium growth rate. It is stemless, with sessile leaves emerging from an underground rhizomatous stem and arranged spirally in a rosette-like formation. It will eventually produce suckers readily, forming clumps with age. 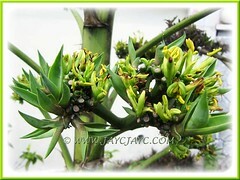 Its eye-catching foliage is bright green to bluish-green, and variegated with creamy-yellow edges in fabulous contrast. 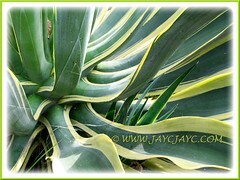 Lance-shaped leaf blades of this Variegated Smooth Agave are fleshy, thick and smooth. It does not have marginal spines or if at all present, they are minute and minimal. However, each leaf ends with a sharp reddish-brown apical spine. Growing in an upright manner, the symmetrical rosette with recurved leaves will create an elegant urn-like or architectural structure that’s most appealing. Agave desmettiana ‘Variegata’ is monocarpic and will flower only once towards the end of its life-span, typically at 10-15 years of age and will die after flowering. 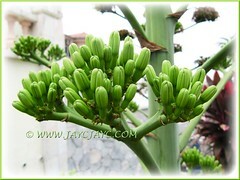 It will produce a thick green flowering stalk, emerging from the center of the plant and towering majestically to 2-3 m (6-9.8 ft) in height, and bearing panicles of bright yellow flowers. 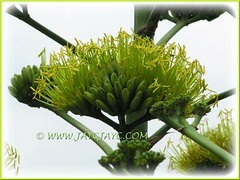 The whole blooming process will last for several months (about 4-5 months), with the flowers at the base opening first. The inflorescences will eventually produce an abundance of bulbils or aerial plantlets that can be propagated into new plants. 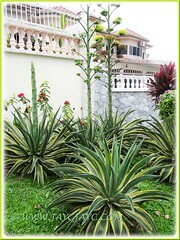 Culture (Care): Dwarf Variegated Agave grows easily with low maintenance. It enjoys the tropical and desert or arid climatic conditions. Light: Grows best in full sun but is tolerant of light shade or semi-shade. However, in shade, the marginal yellow variegation is less vibrant in colour. Others: It dislikes wet feet and if waterlogged, may lead to root rot. You can clip off the sharp reddish-brown spine at the tip of leaf blades, when grown in high traffic areas, if desired. If a single garden specimen is preferred as a focal point, remove the unwanted suckers around it routinely to make its beautiful architectural character stands out. It is generally free from diseases and pests. For subtropical and temperate regions: Hardiness: USDA Zone 9-11. In non-hardy regions with temperature below 25°F, it should be protected from heavy frost or overwintered indoors with sufficient light and minimum water. Propagation: By separating suckers or pups and grow them as new plants. Or propagate by removing and planting the aerial bulbils that are produced on flowering stalks. 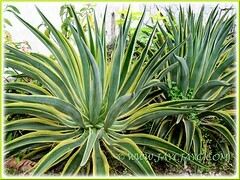 Usage: Agave desmettiana ‘Variegata’ will be ideal for container planting because of its dwarfish stature. With a bold and statuesque form, it will make a stunning landscape plant, whether grown singly as a striking accent or mass in garden border/flower-bed. As it is highly drought tolerant, it’s excellent too for xeriscapes, rock and desert gardens. It is also useful if grown as hedges to fence off animals and undesirable humans. Those are lovely – need lots of room though don’t they? 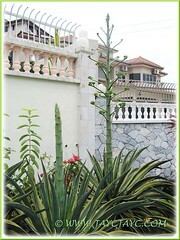 I guess it is not suitable for small garden areas as they become massive and with their towering flower spike. I did manage to collect few pups of agave from a different species but found they are not able to thrive in a shaded garden. I’m guessing they require quite a good sunny area to really do well. I wonder whether you can propagate using their leaves like the ones used as mother in law tongue. Wow, that is a rare sight, have never seen this plant in flower before, nor did I expect the stalks to be so high in proportion to the plant. Interesting! I hope the “undesirable humans” are fenced outside and not inside the Agave desmettiana, otherwise they have a prickly journey to freedom awaiting them! Thank you all for your visits and kind comments. @ Gillian : Not really… a single specimen on ground usually has a crown spread of less than 4 feet but if container-grown, only about 2.5 feet. @ James : Agree with you… though very attractive but not suited for small gardens unless grown in a large container where size will be much smaller. Do keep us informed if you ever try propagating it by its leaf, out of curiosity. @ Manju : Re identifying plants, I’m not an expert at all. Most of our plants’ ID are obtained through laborious search online by comparing photos of similar features, which at times are not reliable. Probably you can upload your photos online (at a free hosting site like Flickr.com) and provide the links here and I’ll follow up thereafter.